Radiohead's Thom Yorke served as co-host on Gilles Peterson's radio show on BBC Radio 1 yesterday. 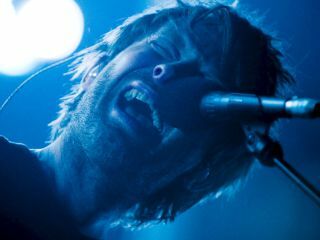 In between playing lots of dubstep, jazz and hip-hop, Yorke opened up about the state of Radiohead, his solo work, the environment and his distaste for touring. "Radiohead is still doing stuff," Yorke said. "In fact, we're starting another session for a month in two days. My biggest trouble at the moment is trying to keep up, but I prefer it that way." As for his solo band, The Eraser, which features Red Hot Chili Peppers bassist Flea and producer Nigel Godrich, Yorke said, "We're going to do something, hopefully in April, but I think that's just more gigs. And then maybe that'll lead somewhere as well. There's lots of stuff going on, but not enough coming out yet." It was confirmed this week that The Eraser will be part of the Coachella lineup. Regarding his recent trip to the United Nations Climate Change Conference in Copenhagen, Yorke, an environmental crusader, was less than upbeat: "Being there was incredibly frustrating. I'm not surprised that nothing got done, given the circumstances and the place and the history of these sort of negotiations." But he did add that he hoped his visit would serve as "a wake-up call." Because he doesn't like the carbon footprint left behind by flying, Yorke said that he has mixed feelings about touring and that, at one point, Radiohead explored the possibility of traveling by train. Ultimately, he said, the group realized it was unfeasible. You can listen to the entire broadcast here.